Mary Tudor's reign is regarded as a period where, within a short space of time, an early modern European state attempted to reverse the religious policy of preceding governments. This required the use of persuasion and coercion, of propaganda and censorship, as well as the controversial decision to revive an old statute against heresy. The efforts to renew Catholic worship and to revive Catholic education and spirituality were fiercely opposed by a small but determined group of Protestants, who sought ways of thwarting the return of Catholicism. The battle between those seeking to renew Catholicism and those determined to resist it raged for the full five years of Mary's reign. This volume brings together eleven authors from different disciplines (English Literature, History, Divinity, and the History of the Book), who explore the different policies undertaken to ensure that Catholicism could flourish once more in England. The safety of the clergy and of the public at the Mass was of paramount importance, since sporadic unrest took place early on. Steps were taken to ensure that reformist worship was stopped and that the country re-embraced Catholic practices. This involved a number of short- and long-term plans to be enacted by the regime. These included purging the universities of reformist ideas and ensuring the (re)education of both the laity and the clergy. On a wider scale this was undertaken via the pulpit and the printing press. Those who opposed the return to Catholicism did so by various means. Some retreated into exile, while others chose the press to voice their objections, as this volume details. The regime's responses to the actions of individuals and to the clandestine texts produced by their opposition come under scrutiny throughout this volume. The work presented here also offers new insight into the role of King Philip and his Spanish advisers. These essays therefore present a detailed assessment of the role of the Spanish who came with to England as a result of the marriage of Philip and Mary. They also move away from the ongoing discussions of 'persecution' seeking, rather, to present a more nuanced understanding of the regime's attempts to renew and revive a nation of worshippers, and to eradicate the disease of heresy. They also look at the ways those attempts were opposed by individuals at home and abroad, thereby providing a broad-ranging but detailed assessment of both Catholic renewal and Protestant resistance during the years 1553-1558. "Impressively well-structured, interdisciplinary book that offers new, important interpretations of Marian England"
- Retha M. Warnicke, Arizona State University. 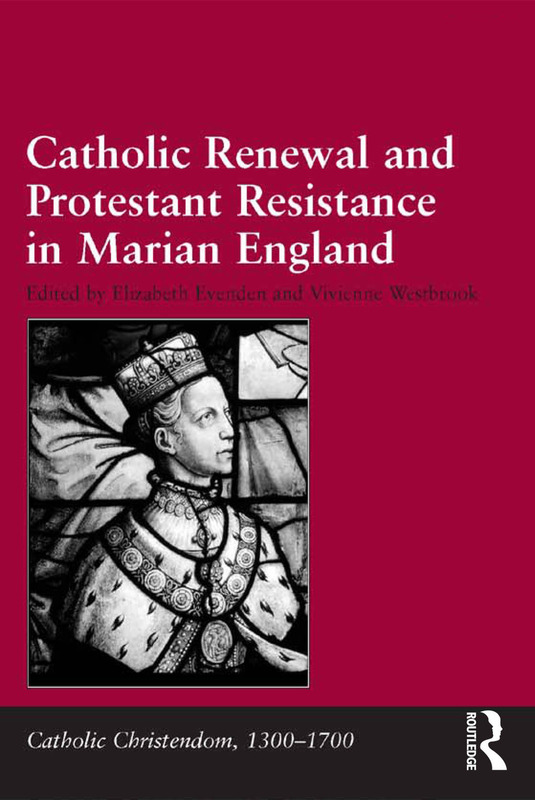 "Evenden and Westbrook are to be congratulated for editing a volume of high quality articles which adds substantially to our knowledge of both Protestants and Catholics in Marian England. Catholic renewal and Protestant resistance is another milestone in the journey away from the outdated view of Mary’s reign as an unproductive cul-de-sac in English history." Contents: Introduction, Elizabeth Evenden. Prologue: The succession crisis of 1553 and Mary’s rise to power, Dale Hoak. Part I Reform and Renewal: Spanish involvement in the restoration of Catholicism during the reign of Philip and Mary, Elizabeth Evenden; The 1557 visitation of the University of Cambridge, Ceri Law; ’Not just the hierarchy fought’: the Marian cathedral chapters, seminaries of recusancy, Thomas F. Mayer. Part II The Power of Print: ’A suitable remedy?’: regulating the printing press, 1553-1558, Ian A. Gadd; The Marian Counter-Reformation in print, William Wizeman, SJ; Oppositional authors and the rhetoric of law in the reign of Mary I, Scott C. Lucas. Part III Enemies of the Marian Order: ’To content god quietlie’: the troubles of Sir John Cheke under Queen Mary, John F. McDiarmid; John Ponet and the people, Andrew Hadfield; The shape of fear: John Rogers in tears and flames, Vivienne Westbrook. Epilogue: ’Mary hath chosen the best part’: the Bishop of Winchester's funeral sermon for Mary Tudor, Carolyn Colbert. Bibliography; Index. Elizabeth Evenden is a MarieSklodowska-Curie International Outgoing Fellow based in the History Department at Harvard University. She teaches Book History, Shakespeare, and Christo-Islamic Literature at Brunel University in London. Her publications include, Patents, Pictures and Patronage: John Day and the Tudor Book Trade and Religion and the Book: the Making of John Foxe’s 'Book of Martyrs’ with Thomas S. Freeman. She is currently undertaking research for a new project on Anglo-Portuguese relations and anti-Spanish propaganda. Vivienne Westbrook is an Associate Professor of English at National Taiwan University. She is Associate Editor for the journal Reformation, and has published widely on early modern religious literature, including Long Travail and Great Paynes: A Politics of Reformation Revision.